How do I restore a backup in SQL-RD? Need to restore your SQL-RD system and files to a previous backup? This is how to do it. This option will restore your SQL-RD system and files to a previous backup. 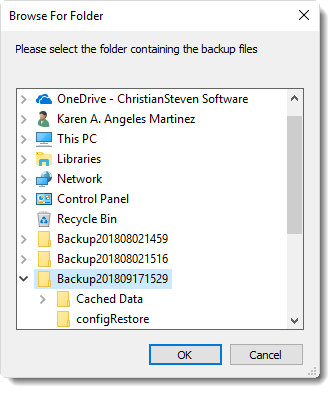 Simply select the folder where the previous backup is stored. When the system is restored, anything that happened after the backup was created will be wiped out. Browse for the folder where the restore can be found. SQL-RD will load the Backup and restore the system settings. After the restore, all of your schedules and cached reports will appear. If you have changed certain defaults and system paths, please make sure you're point SQL-RD to these paths.